This is fully re-built Honda CD200 6 Volt 1979. This bike was totally stripped down and built into this striking Cafe Racer last year, using both new parts and our own Cafe Racer parts it was finished around January 2015 when it flew through its MOT. 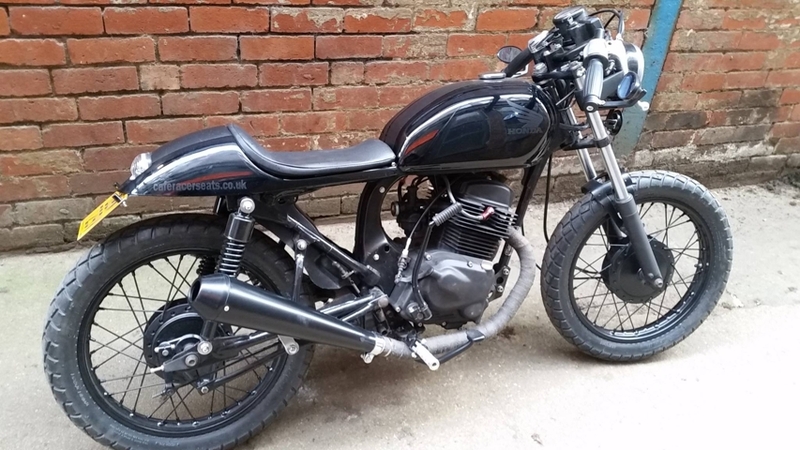 We wanted this bike to be different to the other Honda CD Cafe Racers we have built so decided on no shiny bright work or polishing but instead, matte black. This included powder-coating the exhaust and ace bars matte black. The re-build consists of a modified frame so that our Vincent seat would fit, powder-coated wheels, yokes, side stand and many other small parts and brackets. new wheel bearings, headstock bearings and a sprocket set were all new for this bike. Fabricated link pipes were also made for the Megaphone exhaust to fit the Megaphone silencers in the upswet fashion. A custom wiring loom with all the electrics sat in the seat hump including the new battery which is what made this a head-turning bike. We made a few tweaks to the engine and removed the electric start and all its workings, it’s a real flyer now as the bike weighs very little. the paint is finished with gloss black and matte black stripes and decals. This bike turns head everywhere it goes.